Over the last few months the Pickard Trade Centre has seen many changes. With the rebranding of the Trade Centre, updating of our trucks and the introduction of onsite BBQ's for our tradies. The onsite truck service which we offer continues to be successful and in high demand. With two trucks currently on the road serving the North and South of Adelaide. Both trucks have the ability to create new accounts and process on the spot payments for goods. All payment methods are accepted on board. The two trucks are stocked with a large variety of building & pergola accessories, hand tools, safety gear, fasteners & fixings and a range of cold drinks. Our truck drivers are both well versed on product knowledge and can-do demonstrations with products where available. The response we have seen to our onsite BBQ's has been excellent. 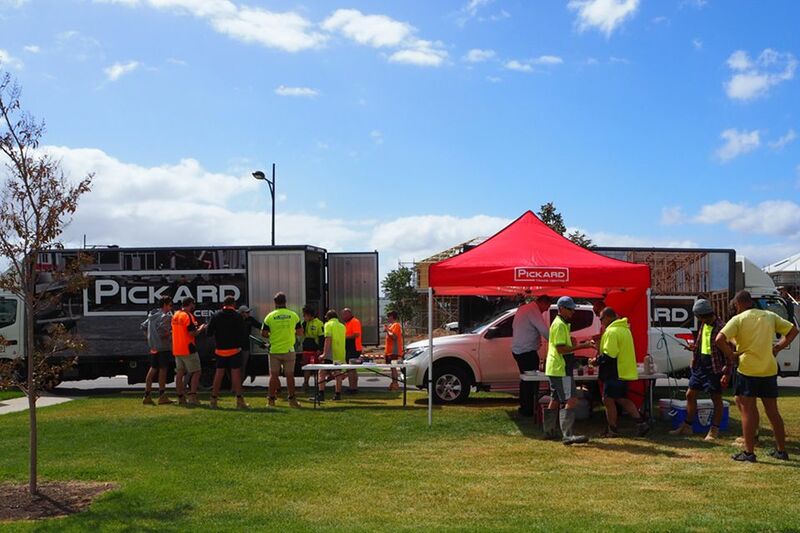 Our last BBQ held at Northgate saw over 40 tradies come and enjoy a BBQ lunch, test out the new Hitachi Nail Gun and get information on our 2018 AFL Footy Tipping Competition. The idea of the Pickard Trade Centre is that we are here for the tradies. It's great to get out and about and meet some of the guys and gals on site, have a chat and support our local building and construction industry. Adam and Aaron can be contact Monday to Friday to organise a truck to come to your work site.